The stinging nettle is one of more than 50 varieties of nettle plants worldwide. As young plants, the leaves are eaten in salads, boiled as a vegetable or steeped to make a medicinal tea. Once planted, stinging nettles need to be cultivated to keep the plants under control, as they may become invasive if not managed in the garden. Start stinging nettle seeds indoors four- to six weeks before the last frost date for your area. Fill peat pots or other growing containers with potting soil and plant one to three seeds per container. Water, as necessary, to keep the soil moist. Transplant the started plants in the prepared garden bed, spacing the plants a minimum of 12 inches apart and 1 to 3 inches deep. If using peat pots, bury them completely in the soil. Water the plants often to keep the soil around them moist. While the stinging nettle can withstand drought-like conditions after becoming established, young plants need consistent moderate to heavy watering. A stinging nettle is mature at the end of the first season of growth. 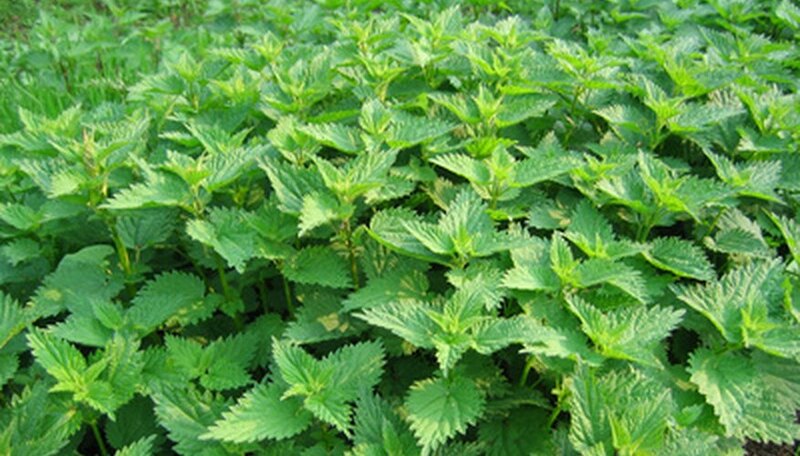 Stinging nettles are a perennial plant and require no further care once they are established in the garden bed. No care is needed to keep the plant alive during the winter months. Once established, it will come back in the spring. It reproduces from wind-blown seeds and the root rhizomes that will continue to spread in the garden bed. Stinging nettles can also be grown from root cuttings. Plant cuttings in a prepared bed in full sun. You can also sow stinging nettle seed directly into the prepared garden space. Choose a sunny, warm location that is well drained and fertile. Stinging nettles will benefit from organic compost added as a soil addendum or applied as a mulch around the plants. If you are unsure if the seed has been stratified, place the seed in the refrigerator or freezer for 30 days before planting. Harvest the leaves of the plants at anytime during the growing season. Roots of the plant are best harvested during the fall after the growing season.